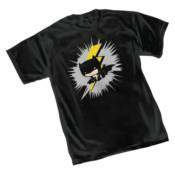 Two sides of the Dark Knight can be seen on this month's shirts. Batman: Heat featuring art by Jock and Batman: Cutie are both screenprinted in full-color on black, 100% cotton heavyweight tees. Choose your DK. NOW AVAILABLE for sale in Canada and U.K.